Home Food Stars and Stripes Are The Best Way to Celebrate! I have adding more fruits into my diet. But beyond eating them alone and in smoothies I hadn’t discovered many other creative ideas to get my daily intake. That is until I found this recipe for healthy popsicles. To form these pops I decided to go with some cups for my molds, not only because it’s something most people have access to, but because I love the fact that they have flat bottoms for placing the stars! I already had an ice cube tray with a place for making star shaped ice cubes. So, I made some white frozen stars with some yogurt, and put them into the bottom of my cup. 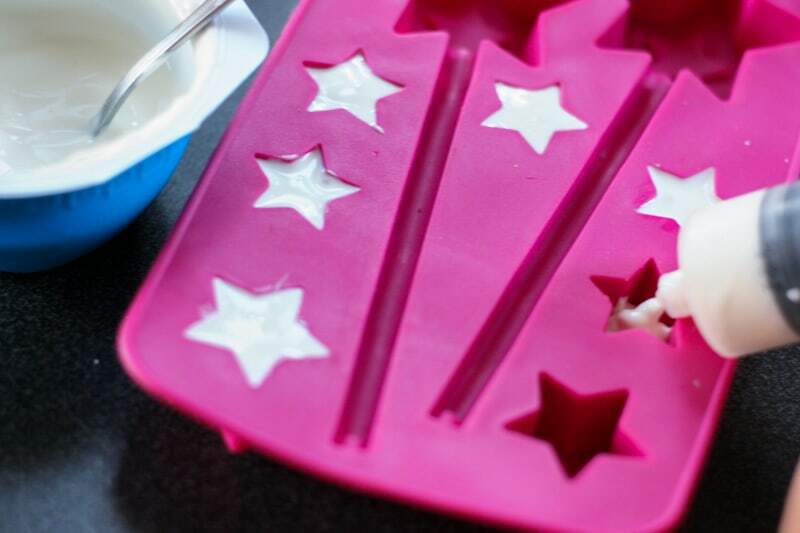 If you don’t have a star shaped ice cream tray, you can take a white fruit, like thinly sliced pears, and cut stars out of them with a star shaped cutter. For the blue section, I puréed some blueberries and covered the stars with them. For the white layer, I used more greek yogurt, but you could also use coconut milk. If you want it to be sweeter, sweeten it with honey or another sweetener of your choice. To keep the stick up and in place in the center of the cup, I poked a hole in some aluminum foil that I placed over top of my cups. I then stuck the popsicle stick through the hole in the foil, and into the layer of greek yogurt. Once the yogurt froze, the sticks stayed up on their own, and I didn’t need to use the foil anymore. For the red layer(s), I puréed some strawberries and poured them over the white layer. If you want to make stripes, of course, you can repeat the layering of white and red as many times as you like! I didn’t use any honey in any of the layers of my popsicle, trying to cut back on added sugars, but if you have a sweet tooth you’ll definitely want to add some honey or other natural sweetener, especially to the yogurt and strawberry layers. They are pretty, easy, and healthier than the store bought Popsicles! 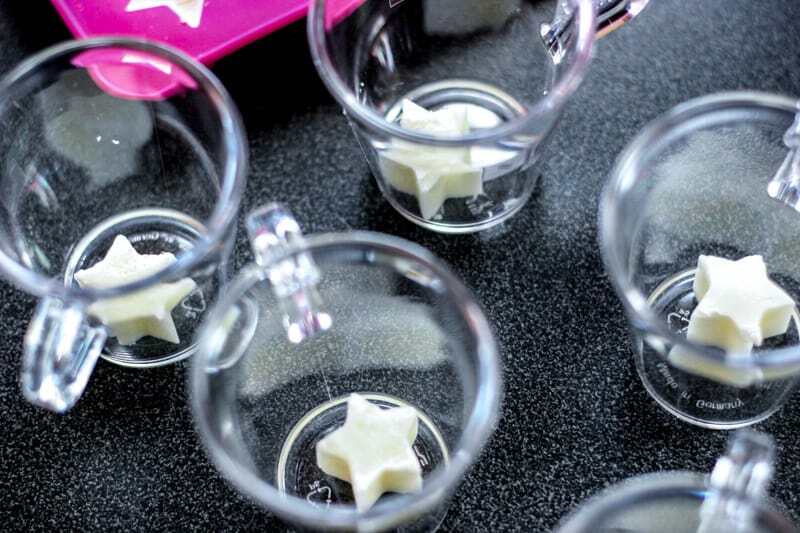 To begin, make your white stars by making “ice cubes” out of the greek yogurt. You can use coconut milk, coconut cream, or coconut yogurt instead to make these vegan and paleo. You can also sweeten the yogurt first if you want these to be sweeter. Meanwhile make a puree with your blueberries. You can add a little honey into the puree for sweetening. Add a white start to the bottom of a flat bottomed popsicle mold. I used small cups with a flat bottom. 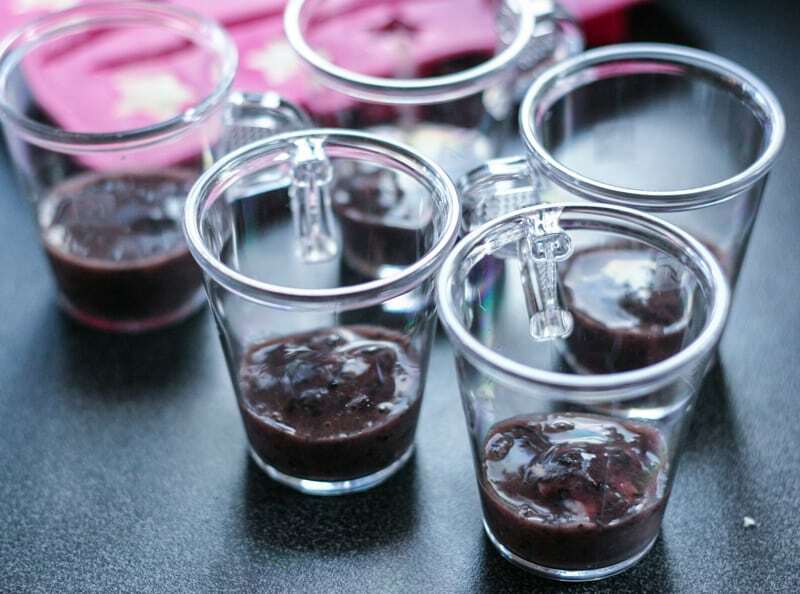 Immediately cover them with your blueberry puree and freeze again. Once frozen add a layer of yogurt or coconut. 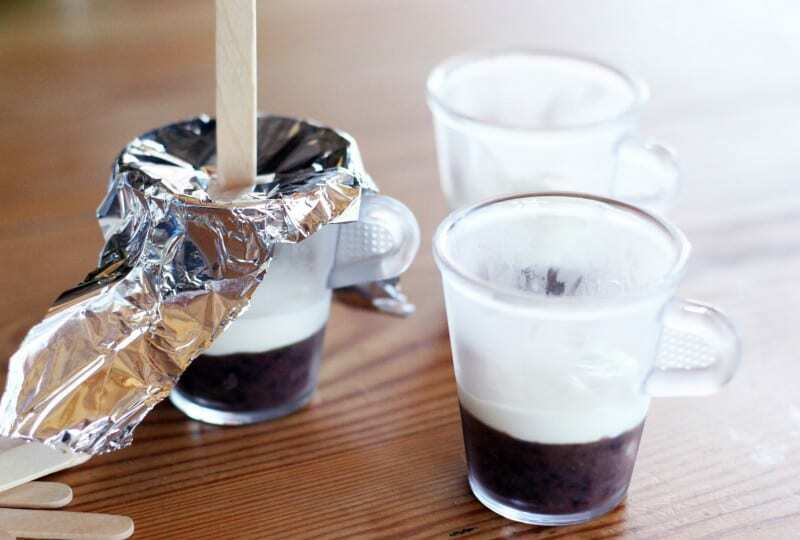 Place the popsicle stick into the yogurt layer. I used some aluminum foil to hold the stick up, and then placed them into the freezer to freeze the stick in place. Puree your strawberries; you can optionally sweeten the puree with honey. When your yogurt layer is frozen, cover it with a layer of strawberry puree and freeze again. Follow the process with one more layer of yogurt and one more layer of strawberry puree. 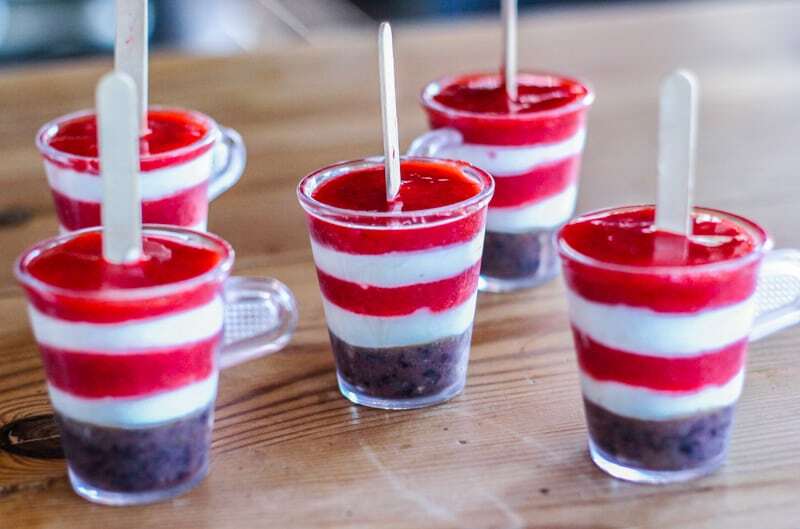 When you are ready to serve them, you can ease the popsicles out gently by warming the sides of your cups with warm water while you gently pull on the stick.